This one-bedroom apartment in Barcelona is ideally located near the beach and the many bars, cafés and restaurants that line the beachfront. Only a ten minute walk from the center of the city, tenants can enjoy all that the Catalan capital has to offer. This apartment can accommodate up to four people. 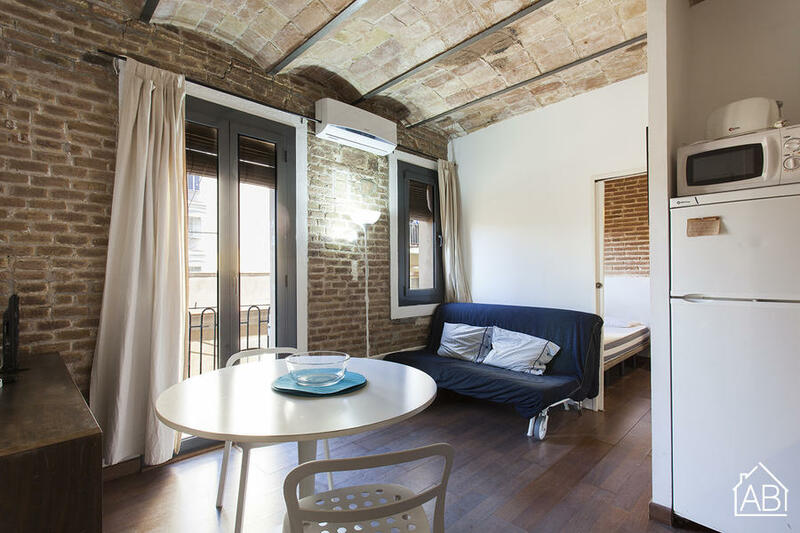 The apartment is a true testament to the rich historical heritage of the city and the original ceiling beams, exposed brick walls and opaque floor only adds to the rustic ambience. The kitchen is compact, but well equipped with all the utensils and appliances needed to prepare your own home-cooked meal, which you can enjoy al fresco on the balcony. The apartment has 4 single beds and one bathroom, beautifully finished in cool, white tiles equipped with a walk-in shower. The apartment also has heating and air-conditioning, ensuring tenants will be comfortable all year round.